NOTES: Multimedia kit with resin and photoetched parts. Taking what many considered to be an obsolescent aircraft, the Finnish Air Force managed to use these aircraft with a great deal of success against Soviet invaders during the Continuation War. Originally requested just prior to the Winter War, the 239 was hurriedly shipped from a US Navy production order to Finland as fast as was possible. Unfortunately, even 'as fast as possible' wasn't quick enough and they arrived shortly after that conflict had ended. These were basically de-navalized versions of the F2A-1. That meant no arrestor hook and the life raft housing was replaced by a more simplified RDF loop antenna. The Wright 1820-34 was replaced by an export version of the Cyclone; the 1820G-5 of 950 hp. These planes were given the serial numbers BW-351 to 394. Additions made to the aircraft in Finland include an armored head rest and a reflector gun sight in place of the ring and bead version used by the navy. The Buffaloes were all assigned to LeLv 24 and were well liked by their pilots. 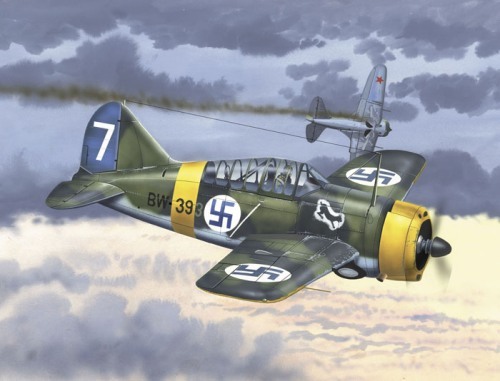 When the Continuation War began in June 1941, LeLv 24 was in the thick of the action against Lagg-3s, Yak-1/7s, Hurricanes, P-40s and P-39s flown by the Soviets. Many of Finland's most successful aces garnered victories flying the Buffalo. By late 1942/early 1943, maintenance of the Buffaloes had become a real problem. Thanks to Finland's alliance with Germany, all parts support with the US had been cut off. Several airframes were fitted with captured Soviet M-63 engines (license built versions of the Cyclone) and a program was started to developing Model 239s with wooden airframe components. Only one aircraft, named 'Humu' was completed before the program was terminated. In May of 1944, remaining Model 239s were transferred to HLeLv 26 who operated them in the Leningrad region until an armistice with the Soviets was signed in Sept 1944. Then the remaining aircraft were used against the retreating Germans with the last kill being scored against a Ju-87 in January 1945. A full wartime score of 496 victories was attributed to the Buffalo and some still carried on training duties until withdrawn in late 1948. This may sound redundant (and it is), but the two Buffalo kits have exactly the same plastic. Not really surprising as the Model 239 was the remainder of the F2A-1 construction originally going to the US Navy. Looking very much like a modern MPM kit, this one consists of three sprues of very nicely done engraved panel line plastic, one sprue of equally nice clear plastic, a small bag of resin parts, a photo etch fret (looks like Eduard), and an excellent decals sheet. The overall detail level of the parts is really quite good. Sprue gates are properly small, there are not any indications of sink areas, flash or small ejector pin marks. There are the usual ejector towers in the large bits like the wings and fuselage, but these are simple to remove and grind or sand down. 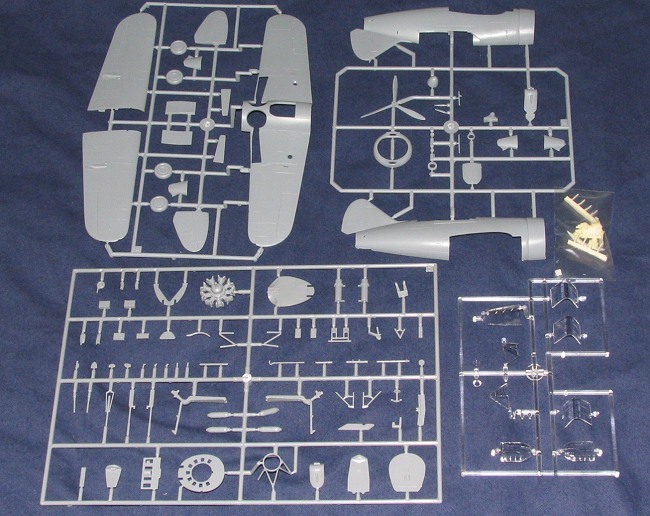 You get a very complete wheel well area that reminds me a great deal of the detail provided in the Tamiya Wildcat kit. The same can be said for the cockpit, which is most complete with various boxes and levers on the side wall. Everything else is there from rudder pedals to seat belts. The life raft housing is also included. A lot of the small details including the instrument panel are provided on the photo etch fret. This also makes up the bomb shackles, which many will probably choose to leave off the completed model. Two bombs are also included with nicely done p.e. fins. Other photo etch bits include brake lines as well a s a multitude of interior bits. A photo acetate sheet is provided for instruments on the panel and consoles. Resin is kept to a minimum on this kit and is only used for the engine accessory section and for the ribs on the upper wheel wells. Aside from the bombs and shackles, there are no other optional pieces. As this kit is identical to the Finnish boxing, there are a few bits that are not used. The transparencies are nice and thin so there should be no problems displaying the canopy in the open position. Instructions are really quite good and apply specifically to the Model 239 version kitted. Color information is given in generic names and applies to the basic interior construction of the kit. Each of the construction drawings are well done and it doesn't seem that there will be any ambiguity problems. Small additional drawings and notes are included throughout the construction process. 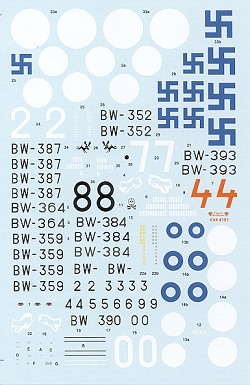 Markings are provided for no less than nine aircraft, ranging from the first deliveries in overall aluminum to post-war aircraft with the circular roundels. Included in the mix are the planes of aces Hans Wind, Ilmari Juutilianen, Eino Luukkanen, and Eero Kinnunen. Classic Airframes provides full color renditions on its website. The decals themselves are superbly printed with no detectable registration problems. White backgrounds to the insignia are provided separately to help alleviate possible registration issues. Thanks to this truly excellent kit from Classic Airframes, it is now possible to build an accurate Finnish Buffalo without having to resort to conversion sets or general hacking at existing kits. The overall detail level of this kit is such that no other aftermarket is required to build what will be an outstanding replica.